National apprenticeship week took place this week 5th March – 9th March. 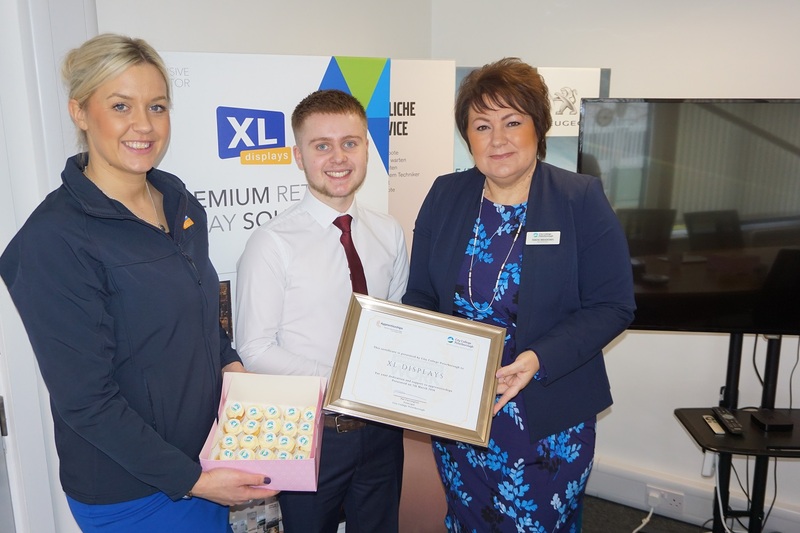 Here at XL Displays, we supported this awareness week and took part in activities to raise awareness and promote our current apprenticeship vacancies. At XL Displays, we are suppliers of Exhibition Stands, Display Boards, Banner Stands and more. We love apprenticeships! We believe apprenticeships give young people in our local community the chance to get their foot in the door in the world of work and explore potential career paths. We promote learning in our business and believe apprenticeships are a great way for individuals to learn new skills in the workplace whilst also gaining qualifications to help them progress in their career. We currently have 9 staff members completing apprenticeship schemes and are recruiting for 3 more due to expansion. National apprenticeship week was a great opportunity for us to show our support for apprenticeships, raise awareness of the benefits they can bring to young people and promote our current vacancies. On Tuesday 6th March, we had a visit from Tanya Meadows, Deputy Principal of City College Peterborough. Tanya visited our main offices in Peterborough to experience for herself what life as an apprentice is like here at XL Displays. On her visit, she spoke to one of our current apprentices, Alex Squibb, who is currently based in our customer service department. Alex is an extremely ambitious individual and hopes to go into business development and sales as his career progresses. In interview with Tanya, Alex said “I’m really enjoying myself here at XL Displays, one thing I love is that they don’t judge me on my age. I’m given opportunities to do things I want to do to get where I want to be”. We were presented with an award from City College Peterborough for our dedication and support to apprenticeships which we were flattered to have received. We work closely with City College Peterborough so being able to support National Apprenticeship Week alongside them was a real pleasure for us. On Thursday 8th March, we took part in an awareness day at Queensgate shopping centre in Peterborough, run by The Skills Service. This event saw a group of local businesses show their support of apprenticeships in the city and promote their current opportunities directly to young people. We were taken back by the commitment of students who travelled to come and speak to us about opportunities we have to offer. It was great for us to meet young people and talk to them about apprenticeships and future career prospects. We thoroughly enjoyed talking to other local businesses about what apprenticeships mean to their business. The Skills Service organised a very informative day filled with positivity and enthusiasm for apprenticeships, which was great to see. We were flattered to have been able to be part of this event amongst big companies in Peterborough. Throughout National Apprenticeship Week, we recorded a video blog of highlights and interviews taken during the week. Watch our latest Vlog and see how we supported National Apprenticeship Week. For more information about our product range or our Apprenticeships, contact us or call us on 01733 511030.